How desperate do you have to be to sign up for a social experiment that promises you a comfortable life at the expense of your freedom? Young couple Stan and Charmaine seem to have reached that point when their area in the North American Rust Belt is hit by mass unemployment, they are forced to sleep in their car, and their only regular treat is a breakfast of coffee and stale doughnuts. Life in the twin town of Consilience/Positron promises the perfect solution for them: a job, a home, a meaningful life. The only catch is, once you’re in, you can’t ever leave. Nevertheless, Stan and Charmaine seem to have few doubts. Or at least they are quick to ignore what niggles they might have. A nice meal at the restaurant and a pair of soft bath towels at the Harmony Hotel seem to seal the deal. Life seems good at the beginning. Stan and Charmaine spend alternate months living together in their house in Consilience and working in the town, and the others separated from each other at Positron Prison. And it’s the prison months that really mess with their brains. But the couple seem prepared to go to great lengths to preserve their sheltered and comfortable life, their illusion of being safe. And as they do, they cross lines they might never have touched before and test their relationship to the limits. Albrecht Dürer, Rhinoceros (1515). © Staatliche Museen zu Berlin. Kupferstichkabinett. Dürer’s rhino, Luther’s Bible, Bismarck dressed as a blacksmith, a VW Beetle and a replica of the gate to Buchenwald concentration camp – the exhibits of the ‘Germany – Memories of a Nation’ show seem both somewhat random and predictable. What I was missing most of all was a grand narrative guiding me through the exhibition, directing my view from one item to the next with that inevitable logic with which A leads to B leads to C, although, as a historian, I should really know better. I was probably expecting the museum counterpart of the undergraduate introduction to modern German history, ‘From Bismarck to Hitler’, or, if we want to start in the early modern period, ‘From Luther to Hitler’. And this being a British exhibition originally created for a British audience about its World War II enemy, some of that was certainly there. But it seems that the collaboration between curator Barrie Cook of the British Museum, and his former boss, Neil MacGregor, also tried to avoid too much coherence and inevitability, and that was probably a good thing. Yes, there was the Reformation with the invention of the printing press and Luther’s Bible translation, there was the Thirty Years’ War, there were references to the nationalist movements of the early nineteenth century with their romanticised depictions of the German countryside, and space dedicated to Bismarck’s German unification of 1871. Yet, none of those movements settled the national question in any sort of definite or satisfactory way. The Reformation left Germany divided into Catholic and Protestant states and any subsequent attempts at German unity were overshadowed by the question who should or should not belong to the club. Slack has not set himself an easy task as he analyses the concept of improvement in its ‘intellectual and political as well as social and economic’ (14) context across an entire century. But he does so most elegantly and eloquently, and the wealth of primary sources – both printed and archival – he employs shows that this book has been many years in the making and draws on decades of research. In fact, the work stands out more for its author’s extensive knowledge of the period, the great synthesis of a large amount of scholarship and the lucidity of its analysis than for the novelty of its argument as such. For the book is unashamedly ‘Whiggish’ as a ‘story of progress’ (263), as its author acknowledges, telling the story of England’s rise as a great nation based on the steady and ambitious improvement of agriculture, manufacture and trade, which would lay the foundations for its Empire. The motor of this ‘gradual, piecemeal, but cumulative betterment’ (1) were a number of creative minds dedicated to the task of making England more efficient through the application of their learning in the form of new social schemes and institutions. The foundations for improvement had already been laid under Queen Elizabeth and the early Stuarts with men like William Cecil and Francis Bacon, but things really began to take off with the English Revolution and the various projects of the Hartlib Circle, which combined utopian speculation and social reform. When I left my last academic job, a good friend and colleague gave me Ian McGuire’s campus novel Incredible Bodies, in case I would have any regrets. Like Kingsley Amis’s Lucky Jim and Malcolm Bradbury’s The History Man, it’s a satirical novel about academic life and the dysfunctional characters that populate our universities and take themselves way too seriously, while pretending to shift the paradigms of this world with their research. At the centre of the novel is Morris Gutman, a thirty-something over-worked and underpaid temporary lecturer in the English Lit department at the University of Coketown, who is still learning the ropes of the system while others are embarking on successful careers. The aptly-named Gutman is a Candide-like character, who naively stumbles through the academic world thinking hard work, original ideas and compliance will eventually land him a permanent academic position. Alas, he soon comes to find out that it’s all about politics and whether or not certain people in power like you. Despite the plethora of literature that has been published on the English Revolution and Restoration over the years, the topic of exile during this most exciting period of British history remains an understudied area. There is still much unseen primary source material to be uncovered in European and North American archives and plenty of gaps in knowledge to be filled. 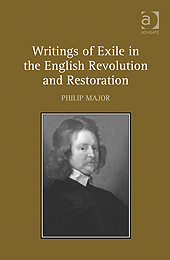 With Writings of Exile in the English Revolution and Restoration Philip Major has taken the plunge and produced a fascinating yet somewhat disjointed book. Tackling Edward Hyde as the ‘Case Study of a Royalist Exile’ the first chapter engages with ‘many of the key corollaries of dislocation and dispossession with which royalist exiles are habitually preoccupied’, including ‘the loss and reassertion of identity; displays of stoicism, patriotism, friendship and nostalgia’ and the ‘intense debate on the discernment of divine providence’. These are accessed through ‘a close reading of Hyde’s Contemplations and Reflections on the Psalms of David’ (27) begun during his first exile on Scilly, Jersey and elsewhere during the 1640s and 50s and completed during his second exile in Montpellier in the late 1660s and 70s. Chapter 2 on ‘Ceremony and Grief in the Royalist Exile’ explores the reaction of royalists ‘to the death of fellow exiles, as well as friends and family left behind in England’ (67). Major highlights the extent to which the use of the Book of Common Prayer in burial rituals as well as other Episcopalian traditions gave displaced royalists a shared sense of identity, while deaths within the exile community also enhanced Prince Charles’s public role and helped to revive the patriarchal image of King Charles I, which after the regicide was transferred to his son. Chapter 3 deals with ‘Royalist Internal Exile’, primarily focusing on the banishment of royalists from London and their confinement to the countryside where focus on friendship networks and shared value systems and traditions resonated with issues pertinent to external exiles. 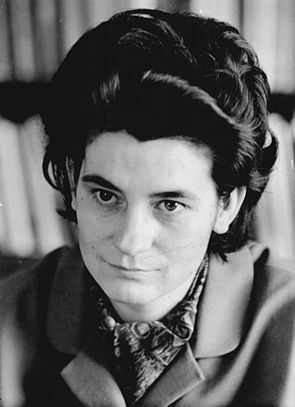 East German writer Christa Wolf (1929-2011). Twenty-five years after the fall of the Berlin Wall I have finally finished reading Divided Heaven by the East German writer Christa Wolf. 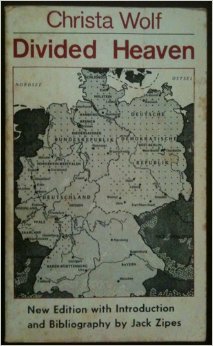 It is a love story ended by the separation of the two Germanies, completed by the construction of the Wall, which aimed to prevent the defection of Eastern Germans to the West. Divided Heaven, first published in 1963. In Wolf’s novel the female protagonist Rita, a young woman from the East training to be a teacher, is in love with the academic Manfred, who one day fails to return from a conference in West Berlin. Manfred sends Rita a letter from the West, asking her to join him. But even before she visits him in the fateful summer of 1961 she knows that she cannot stay. Rita’s heart is in the East – with the people in her little village and with the workers in the factory, where she spends her summers. She is not attracted to the well-stocked shops in the West or the flashing lights of the big city, and in the end her love for her home, her socialist ideals and her wish for a break with the Nazi past is greater than her desire to be with the man who betrayed her trust. 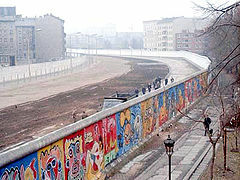 The Berlin Wall, built in 1961. It is an odd story to read twenty-five years after the socialist dream collapsed. It is a book that sheds a very different light on what it was like to live in the East. While Wolf does not shy away from criticising the rigid rules, the hypocrites and the corruption of the GDR system, she also shows the reader that there were real people with real ideals on the other side. As usual with many failed political systems it was not the ideas, but the brutal manner of their execution that led to their downfall. Is it ok to laugh about Hitler? This seems to be the one big question critics have been asking themselves about Timor Vermes’s Look Who’s Back – a novel about Adolf Hitler waking up in 21st-century Berlin seeing a confusingly modern world through a Nazi lense. Some teenage boys playing football on a field must be the Hitler Youth training, the large number of Turks in Berlin an indicator that they did support Germany in World War II after all. But Hitler is also impressed by the clever demagogy of the German Bild newspaper with its many pictures and extra large type, regretting that ‘the zealous Goebbels’ did not have that idea first, or the Nazis would have found ‘much more enthusiasm’ for their ‘cause’ amongst the elderly population. 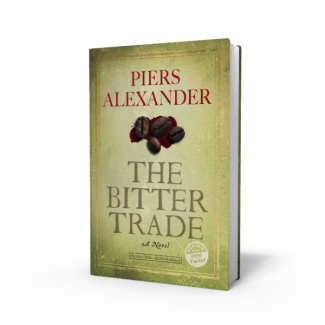 The Bitter Trade by Piers Alexander is a historical novel set in the murky world of London’s coffee houses on the eve of the Glorious Revolution. The son of an English dissenter and a French Huguenot, its young redhead hero Calumny Spinks lives under the shadow of his father’s dark secret dating back to Oliver Cromwell’s time which takes his mother’s life and traps him in the poverty of the weaving milieu. Yet, he is determined to escape his fate and make his way in the world in the newly emerging coffee trade, which is at times only fractionally above board. Along the way, he meets crooks and wise men and a range of strong women, who teach him a thing or two about life and love, and that hardly anyone is who they appear to be at first sight. Torn between the scheming daughter of a wealthy coffee trader, a popish seamstress and the waitress of a coffee house, who all carry their own secrets, Calumny stumbles from one adventure to the next as he uses his wit and ability to imitate voices to climb up the social ladder.